Matt Welsh, Emily Borromeo, Patrick Halley, Billy Lowrimore, Lindsie VanWinkle, Heslens Estevez, Lee Slobotkin, Becca Andrews, and Stephen Mark in The 25th Annual Putnam County Spelling Bee. Photo by APAC. BOTTOM LINE: A revival of a musical comedy about strange and sweet children participating in their district spelling bee. 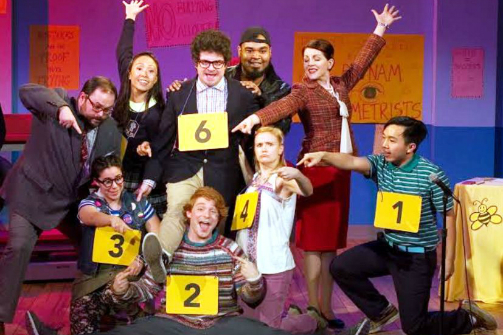 The 25th Annual Putnam County Spelling Bee is a comedic musical that shows an eclectic bunch of school children who all aspire to be the best and win their local spelling bee. Some of them want it out of a love for words while others are programmed by their parents to desire victory. Who will win? Who will make friends on the way to the top? Kids have so many things do deal with as they are learning about themselves and each other that sometimes they just need a little clarification as to their own newly formed thoughts and opinions. Putnam County is a fictional location. Local realtor (and winner of the 3rd annual Putnam County Spelling Bee) Rona Lisa Peretti (Lindsie VanWinkle), is one of the judges who informs us that the winner will not only receive a $200 savings bond toward their education, but also the opportunity to represent Putnam at the national bee in Washington, D.C. Assisting her is Vice Principal Douglas Panch (Matt Welsh) who vaguely apologizes for some type of incident that occurred at The Bee when he helped out five years ago. Then there are the children: First there's Chip Tolentino (Stephen Mark), last year's champion. He is boy going through puberty and even sings about “[His] Unfortunate erection.” Logainne Schwartzandgrubenierre (Heslens Esteves) is a liberal child who loves both her dads very much. William Barfee (Patrick Halley) is a sad and awkward individual, but he has no problem standing up for himself. Each of these individuals has a technique to how they spell each word, and he uses his “Magic Foot,” as he tells us in a song and dance. Leaf Conybear (Lee Slobotkin) can't figure out if he is smart. His family tells him he isn't, and he is only competing here because the first and second place winners from his school bee were unable to attend. The thing is, he keeps spelling the words correctly, so perhaps he will prove them wrong. The seemingly very serious Marcy Park (Emily Borromeo) is having an identity crisis, as she does not want to be thought of as “all business.” She is perhaps the most grown up child I have ever seen. Olive Ostrovsky (Becca Andrews) actually shows up to the bee on her own, not even knowing about the entrance fee. Navigating through by herself seems intimidating, but she does mention that her dad told her he would come after work. Last, but not least, is Mitch Mahoney (Billy Lowrimore) who is a man doing his community service at the bee. He comforts each of the disqualified children with a juice box and a hug. The 25th Annual Putnam County Spelling Bee opened on Broadway in 2005 after a successful off Broadway run at Second Stage. It is a show that has had so many audiences in stitches, and this production is no different. The stand out moment for me was when Andrews sang “The I Love You Song” with Lowrimore and Van Winkle. Their voices melted together to form gold. The one issue I find in any version of this show is the stereotyping. The different actors who play each part look almost identical to each of their counterparts from other reincarnations of the show, based on the recognizable Broadway casting. This means that archetypes are embraced, including the only black actor on stage playing the role of the parolee. Regardless, energetic song and dance numbers litter the evening keep a smile on everyone's face. Audience members even have the opportunity to be a part of the show onstage if they sign up beforehand. The volunteers are even involved in some of the choreography with the help of the actors around them, causing much laughter from the audience. Director Dev Bondarin does a wonderful job honoring the original production and I'm excited to see what APAC tackles next. The 25th Annual Putnam County Spelling Bee is Conceived by Rebecca Feldman. Music & Lyrics by William Finn. Book by Rachel Sheinkin, based on C-R-E-P-U-S-C-U-L-E a play by The Farm. Additional Material by Jay Reiss. Directed by Dev Bondarin. Choreography is by Misha Shields. Set Design is by Tim McMath. Lighting Design is by Adam Honore. Sound Design is by Arielle Edwards. Stage Manager is Nicole Richards. The cast is Lindsie VanWinkle, Stephen Mark, Heslens Estevez, Lee Slobotkin, Patrick Halley, Emily Borromeo, Becca Andrews, Matt Welsh, Billy Lowrimore.